Stacey was born in Barnsley, she briefly lived and worked in Manchester before moving to Stoke on Trent. She now lives in Stoke on Trent with her Fiancé and two children. Stacey attended Newcastle-upon-Tyne College where she attained a Diploma in Interior Architecture. She also attended the University of Derby where she attained a First Class Honours Degree in Architectural Conservation. Stacey has worked within private architectural and consultancy practices delivering small and large scale conservation projects. 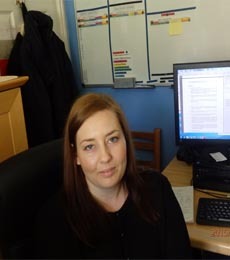 She has also worked within local government conservation teams providing specialist advice and guidance on the conservation and management of the historic environment. Stacey has gained further experience assisting with educational, residential and healthcare projects. Stacey first gained her professional experience working at CTD Architects during the summer holidays while at University. She assisted with various projects but notably the restoration of an Edwardian Shopfront. When Stacey completed her Degree in Architectural Conservation she worked for Purcell. She assisted with various small and large scale conservation projects, assisting with the restoration works to the Grade I Listed Wollaton Hall, Nottingham. Stacey went on to join Stephen Levrant Heritage Architecture in Manchester where she assisted with the preparation of reports and assessments for many large scale conservation projects within Manchester and London. She undertook many surveys of a wide range of building types, determining the significance and condition of many historic assets. She was involved with producing many reports, assessments and statements to accompany planning applications for the conservation of historic assets. She undertook many historic environmental surveys to accompany Environmental Impact Assessments as part of area wide regeneration schemes. Stacey was employed by Staffordshire Moorlands District Council as an Assistant Conservation Officer. Here, she was employed to undertake an assessment of potential conservation areas within the Staffordshire Moorlands. She also provided specialist advice and guidance on the conservation and management of the historic environment. Following a career break Stacey joined bpArchitecture where she has worked on a variety of projects. She has assisted with the preparation of drawings and statements for RIBA Stage 3 planning applications and Stage 4 Building Regulation applications for a variety of Heritage Assets, Residential, Educational and Healthcare projects. Stacey enjoys spending time with her family and particularly enjoys days out.